Each year, Boyar Research publishes their Forgotten Forty report which features the 40 stocks they believe have the greatest potential for capital appreciation in the year ahead, with an emphasis on near-term catalysts. Their 2017 report will be released soon and Boyar has kindly given Market Folly readers a special 20% discount if you purchase by December 12th. Each stock profiled in their report features a one page write-up summarizing the investment thesis, valuation, and what the potential catalyst is. Boyar is also giving our readers a complimentary copy of their Guide to Profiting From Uncertainty. This 100+ page report features in-depth research on 4 additional stocks. To see what you can expect from the Forgotten Forty report, we've received permission from Boyar to post last year's edition for free which you can download here. 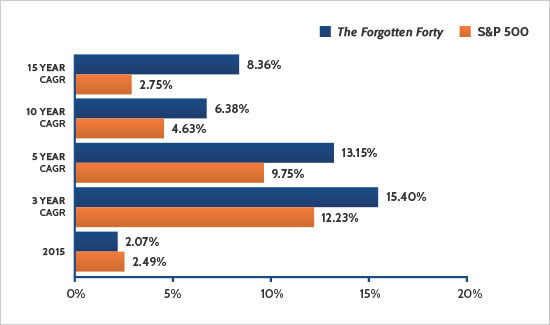 And then you can save 20% off this year's Forgotten Forty report here. As you can see below, the Forgotten Forty has significantly outperformed the major indices on a 3, 5, 10, and 15 year basis. Also, last year's report has outperformed the S&P by 400 bps and eight of the stocks profiled returned north of 31% each. This special 20% discount for our readers expires December 12th, so take advantage before it's too late. Thanks again to Boyar for their generosity. To receive your 20% discount, please click here.